Okay, it sounds like the longer/puffier dress with petticoats was liked by many! Yesterday's "B" struck a chord. So here is Monday's D2 with a longer gown. And different hair. Some of you requested her hair up. D3 has flat shoes (better than boots?) tails on her mask and a big skirt with visible petticoat frill. D4 has Goldilocks ringlets and an empire waistline. I like the blonde hair. I think blonde girls have been relegated to sidekick/comic relief or snob/villain roles lately. Can you think of any popular blonde girl heroes in children's media right now? There are probably tons--I just don't pay attention. I went with "Hunter" class. A female character. I'm shooting arrows at EVERYTHING! So far, so good. But I must admit, the female gait in the game is a little wonky. She swings her arms in a funny, elbows-in/forearms-out style. Must be a Japanese thing. I wouldn't walk that way if I was hunting demons in a zombie castle. Rapunzel in Tangled--blonde girl who later becomes a brunette. And there's always Barbie. The ringlets are fun but kinda creepy too--like the evil little girl from "Cats don't dance." I really like letter H in your last post. She has a batman-like dress. The other princesses are kind of losing the batman. They are becoming to princess-like. I'm kind of happy to lose the Batman. You always see batman fighting crime, when was the last time you saw a princess fight crime? Edith, blonde Rapunzel? I don't know any BLONDE Rapunzels. There is only one Rapunzel and her hair is RED. But now that I think of it, there is Tinkerbell...and Barbie. Sorta forgot about Barbie...okay, there are plenty of blonde heroines. I adore D3. I do not know how you could top her. 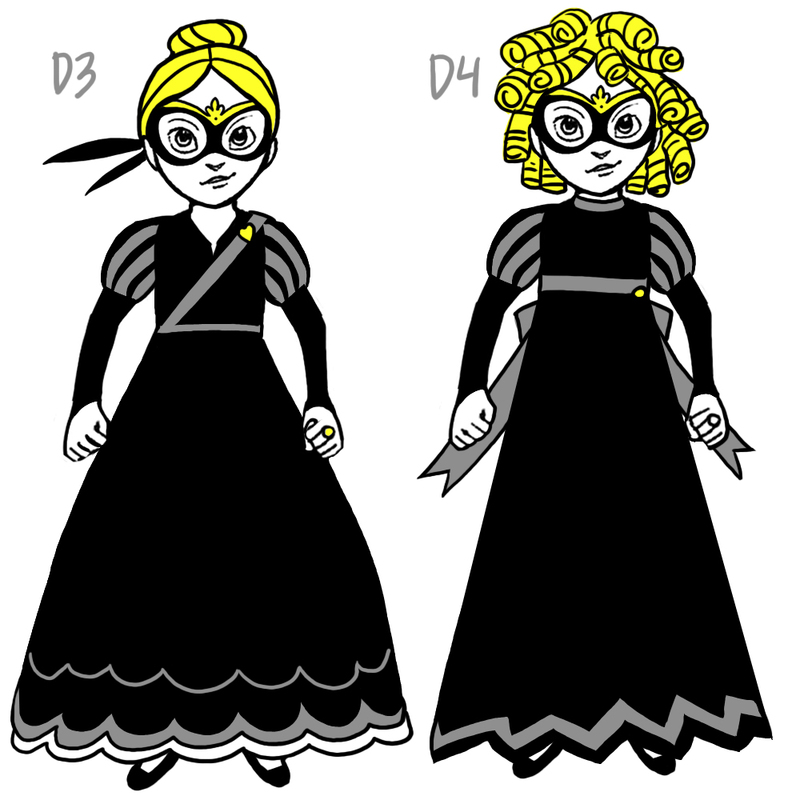 Having her hair done up would be better for fighting and balances out the bulkiness of the petticoats, and I can see her fighting crime on the way to the ball. D3 is pretty sweet. Love the bottom of her dress and I like the cross body strap better than D4's empire waist. But I have to agree with Lissa, a little too princessy. Take the masks off D3 or D4 and they are all out princess, not Batman enough. My 4yo says she likes the one on the left best "because she has a lump dress." My favorite was D2 from the last post. I like the blonde hair, but I agree with Lissa that they are losing the batman and becoming too princess like. I also really liked the pigtails, he bun looks a little too grown up. I like both D2 and D3! I also like the blonde hair idea. I think the bow on D4 would be cute with D3 too. D3 is my favourite so far! But I miss the spikey edge on the bottom of D2's dress. The spikes seem essential to the bat image. Blonde hair works perfectly, and I really like D3's lower dress waist and the strap with the heart. So cute. I think ringlets are darling, but then I have my own little blonde who gets ringlets.